“Create once, run anywhere” approach will enable organizations to maximize investment of their mobile initiatives. We provide a web-based platform that any user or company can use to create personal or business app for iPhone and android. We provide a tool that any user or organization can use to create, customize and manage their own iPhone/iPad/Android application via online creation engine and host its content in our web CMS, sell in their Mobile Commerce Store..
Our platform, Do It Yourself automated engine for building mobile applications, helps you to create apps using our web interface without programming skills required. ✓ Mobile Commerce Store feature. Now our customers may sell products directly through their apps! Users can browse individual items (with photos, descriptions, and prices), and make purchases via secure PayPal shopping cart. Now you can easily build iPhone and Android mobile commerce apps for your online store or quickly integrate eCommerce functionality into your existing app! Traditional e-shops look good on computer screens, but are difficult to use on modern mobile devices. 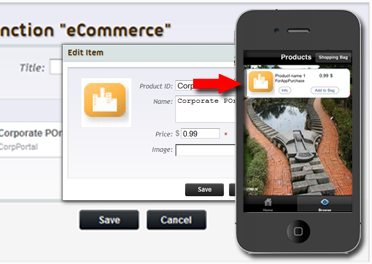 iBuildApp presents your shop's offer to mobile customers simplifying shopping for them. Launch your mobile shop with ease! ✓ Safe payments - supports PayPal integration. The product roadmap for later this year includes the addition of barcode scanning, private sales, and analytics. ✓ Intuitive interface gives anyone the ability to design and deploy professional iPhone Applications. ✓ Full Control – update/ refresh your content on demand, publish and truck status of your applications. ✓ How can I publish my application on the app store? ✓ How can I generate Certificate Signing Request? ✓ How can I save Certificate ( .p12 file) on my computer? ✓ How can I create Distribution Provisioning Profile (.mobileprovision)?